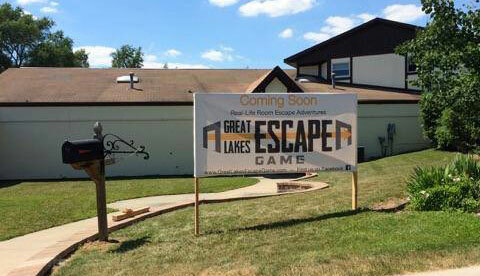 Crews have been working inside 566 S. Main St. in downtown Frankenmuth to transform it into an escape game, the newest form of entertainment to arrive in the Great Lakes Bay Region. When Great Lakes Escape Game opens this summer, teams will venture inside and find themselves challenged to break free from a room filled with intriguing gadgets to explore, captivating puzzles to solve and cryptic clues to decipher. Team members manipulate everything that’s not bolted down as they search for answers. They have to act fast, though, because they only have 60 minutes to escape. This week, our sign arrived and will be on the building soon. Watch our website for news about our opening date and opening weekend specials.